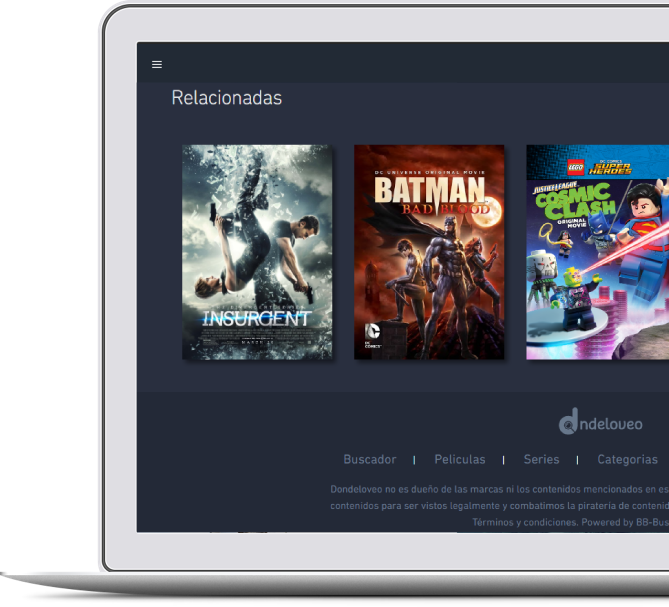 DONDELOVEO solves a problem for users when they don’t know which platform offers the content they want to watch. At present, when users google content, the top results shown by the search engine’s algorhythm are infringing sites such as Cuevana or Pop Corn Time. Therefore, DONDELOVEO is also a defense of copyrights and a way of informing audiences of legitimate OTTs in our region. A search engine linked to our database can quickly and in a friendly manner show a list of legitimate sites (free or otherwise) where the desired content is available for download or for watching by means of online streaming. A search can be filtered by original version or dubbed, genre, year of release of content, country of origin, producer, performer, director and country where the user is. At present, Dondeloveo covers legitimate platforms in Argentina, Brazil, Chile, Colombia, Costa Rica, Cuba, Ecuador, El Salvador, Spain, United States, Guatemala, Honduras, Mexico, Nicaragua, Panama, Peru, Uruguay and Venezuela. Free for newspapers, magazines and blogs. Adds value for your users. Has a review been written about a movie or series? Dondeloveo will show your readers where to find such content and watch it lawfully. Has a performer, director or film industry of certain country been mentioned? Dondeloveo searches are conducted by metadata and enable finding content in which the performer, director or country has taken part. Let’s protect the media and entertainment industry. Let’s fight infringing sites and content piracy. NOVA ANÁLISE NEW MEDIA ESSENTIALS!